There is not just one Melbourne Fashion Week but two! The first on is the annual LOreal Melbourne Fashion Festival  over one week in March. The other one is the Melbourne Spring Fashion Week during August/ September  in time to get your Spring Racing Fashion. The LOréal Melbourne Fashion Festival is Australia's largest fashion event - a week of fashion, shows, famous faces, exhibitions, business seminars and parties. It embraces the creative arts, innovation, community, commerce and, of course, fashion, - striving for the highest standards, with extensive local, national and international participation. It is a stylish showcase for established and up and coming fashion designers. You have the unique opportunity to experience the latest craze of the fashion industry as well as the cutting edge of marketing, promotion and exchange of ideas. There are fashion industry seminars and forums, as well as the ultimate Red Carpet Runway. However, the main objective of this Melbourne fashion week is to engage and excite the public about all things fashionable. It provides public access to the exciting and magical world of fashion. Delve into the world of fashion, absorb up-to-the-minute trends in design, and get some great ideas by participating in the Melbourne Fashion Festival. Here is where you can pick up the coolest outfits  and de-clutter your wardrobe. It is the super-savvys swap of fashions, fabulous frocks, nice knits, slick suits and a colourful array of accessories. Swap to shop and save your pennies and the planet! The swap is on, one day during the Melbourne Fashion Festival. You can swap everything from designer wear, to good quality basic garments from local high street stores. This is where a great little frock from a basic label can upstage a designer dress, as the beauty is in the eye of the beholder, and individual style and fit are more important than branding. These are screened for quality at the door, and are swapped one-for-one. Garments need to be clean, folded or pressed, free of faults, likely to be valued by others, but no longer your favourites! The Clothing Exchange is opened after everyones contributions have been screened to ensure a fair swap. 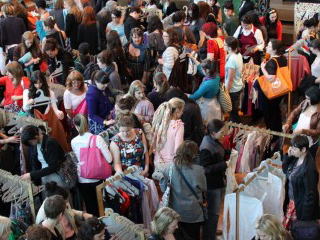 The Up & Comers Fashion Market is held over two days before the Melbourne Fashion Week. It brings together Australias latest independent clothing and accessories designers. These are selected for their creative designs and unique perspectives. The market acts as a launching pad for emerging fashion designers, and a great opportunity to shop for something unique and special. It has become a fashion hub, and is a great place to discover our citys next big names. Youre also sure to come across some great vintage clothing and jewellery finds. There are over 50 fashion stalls, filled with clothing, jewellery, and accessories for men and women. The Up & Comers Fashion Market takes place at St. Ali, a laneway in South Melbourne. This Melbourne Fashion Week is another annual celebration of fashion in Melbourne. You get to see our best Australian fashion designers, labels, styles and retailers  in runway shows, fashion parades, exhibitions, film screenings, workshops, workshops, celebrations and plenty of parties. For a week across August/ September, Melbourne is a-buzz with its fabulous fashion events, and the who-is-who of the Melbourne Fashionista, celebrating Melbournes unique style and love for fashion, shopping, beauty and design.